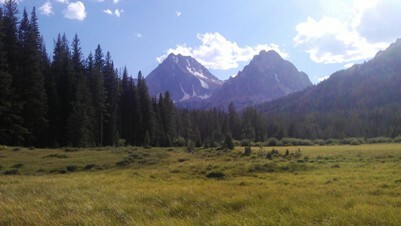 The White Cloud Mountains are gems of the Idaho backcountry. This compact range, located east of Stanley and south of Clayton, and it's surroundings, have a lot to offer to a wide variety of backcountry users including hikers, skiers, mountain bikers, motorcyclists and equestrians. This is another area that mountain bikers and motorcyclists should visit as soon as possible. If a minority of interests (some out of state) get their way, this area may one day be closed to mechanized travel. This, at least in my opinion, would be a shame. One of the best ways to experience this area is by traversing it from south to north via Little Boulder Creek, Big Boulder Creek, Railroad Ridge and French Creek. This 36-mile route, which consists of challenging single track trail and some jeep trail, crests two of the highest passes in the state legal for mechanized travel. It is just incredibly scenic. The easiest way to reach the Little Boulder Creek trailhead from Eastern Idaho is to proceed 17 miles south along ID 75 from the intersection with US 93 a few miles south of Challis, then proceed about 19 miles, generally south, along East Fork Road to the trail head (which is well-marked). 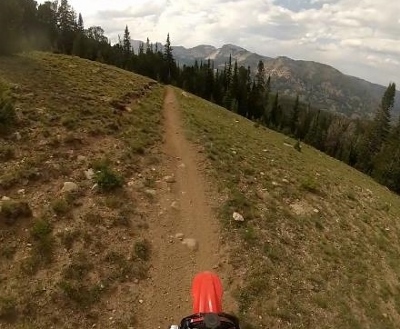 When ridden from south to north on a dirt bike or mountain bike, Little Boulder to Big Boulder is 15 miles of intermediate difficulty single track trail. One of the highlights of this section is cresting the 9500' pass between the Little and Big Boulder creek watersheds. 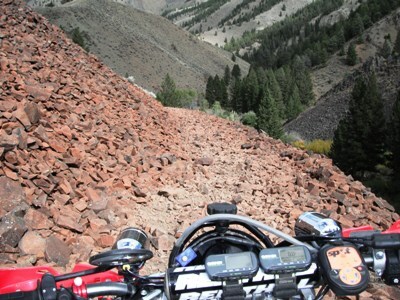 The descent along Big Boulder Creek ends at Livingston Mine (7200'). 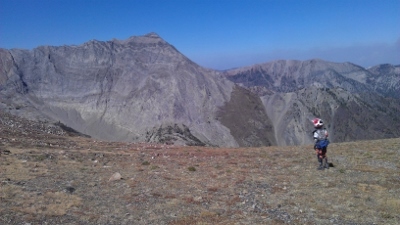 Next is the spectacular three thousand foot climb to Railroad Ridge (10,440'), one of the two highest spots in the state accessible via motorized vehicle. Though frequently swept by storms during the summer months, Railroad Ridge is a wonderful place to loiter for a few hours amidst breathtaking views in all directions. is of only moderate difficulty when ridden from south to north. Be very careful near the end of the trail just south of Hwy. 75. Do not ignore the No Trespassing sign and cross the narrow strip of private land between you and the road. 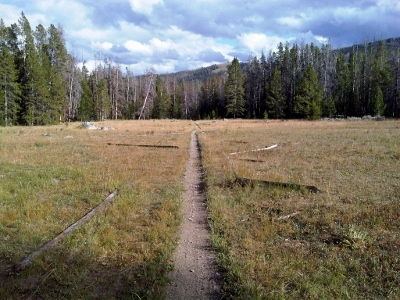 Stay on the trail as it bears left and skirts private property. This route is open most years by Mid-July and stays open into October. Along the way I have encountered a variety of large wildlife including bear and magnificent wolves. Stay alert. 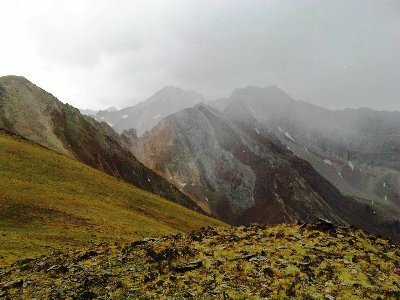 This entire route lies at high elevation in a very remote region of the state. Cell phones will not work anywhere in this region. Though parts of the route (Big and Little Boulder Creeks) are reasonably well-traveled (at least on weekends), you are not likely to encounter anyone most of the rest of the way. The entire area is subject to rapid and extreme changes in weather - for which you must be prepared. Do not venture up onto Railroad Ridge in any open vehicle when electrical storms are either likely or present. Big Boulder Creek to French Creek is on the Tour of Idaho.